Two of the British folk scenes most accomplished performers, Kathryn and Sean have graced stages the world over in a number of guises. The intimacy and strength of passion shown as a duo, combined with an eclectic repertoire ensures a rare treat for any listener. Born and raised in the South Yorkshire mining town of Barnsley, Kathryn has sung since she could speak. An early duo career with fellow Barnsleyite, Kate Rusby, led to much critical acclaim and an award winning album along with Kathryn being the first singer to win the revered BBC Young Tradition award. 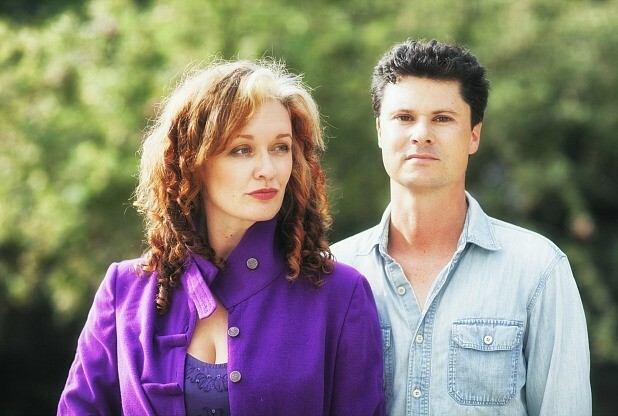 The Kate and Kathryn partnership led swiftly to the teaming up with 3 brothers from West Devon and the folk – pop band ‘Equation’ Her relationship with Sean Lakeman flourished, both personally and musically, and after a decade of relentless touring the two decided to return to their English folk roots and gig as an acoustic duo. Sean Lakeman is a tour-de-force of modern folk music, whether on stage or in the recording studio As the eldest of the 3 ‘Lakeman Brothers’, Sean was raised on Dartmoor and has played the guitar since the age of six. He famously orchestrated the sound of his little brother Seth, producing his most successful albums and scooping many awards. He excels when working in a band or as an accompanist and his musical services have been called upon by many other leading artists and groups. As well as producing all four Kathryn Roberts & Sean Lakeman albums, his production credits include some of the biggest names in British folk and folk-rock including Levellers, Seth Lakeman, Frank Turner, Billy Bragg, Imelda May, Bellowhead and Show of Hands. Twin daughters and a folk-rock whirlwind forced Kathryn (Vocals / Piano / Woodwind) and Sean (Guitar), to sideline their popular duo performances. After almost a decade, 2012 saw a spectacular return in conjunction with their critically acclaimed album ‘Hidden People’. Awards and much praise followed and the couple re-established themselves as one of the top British folk duos. Their 2015 album ‘Tomorrow will follow today’ is simply the cherry on the cake. We are delighted to welcome them to Sutton Benger Village Hall, a friendly and intimate venue with great acoustics.